Our new "Falling Stars" hanging decoration is so magnificent! Use these to fill up a ton of airspace without spending a fortune. 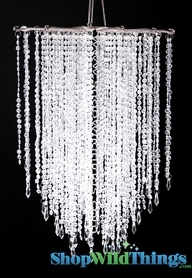 Made of fantastic totally clear faceted octagon shaped beads. Each bead is 12mm (just shy of 1/2") in diameter. There are 14 arms each with 7 strands of beads hanging from them. That's a total of 98 strands of beads! The bottom of each strand is finished with a lovely clear 1.5" pendant. Notice also how the bottom is finished at different lengths, adding visual appeal and style to the fixture. The length is 48". Light kits and bulbs are NOT included with this item. You can purchase a light cord kit separately here - LIGHT CORD KIT or you can place one of our LED light saucers in the top! The LED saucers pictured on this page fit perfectly on the chandelier frame. Alternatively you can light these with your own lighting. Colored lights are well absorbed, making this a very versatile product. You can pretty much make this look any color you please! SEE THE CORDLESS LED SAUCERS HERE. This item works PERFECTLY with our "Upsy Daisy" Column and Chandelier Riser found below. These chandeliers are beautiful and I would recommend this sight and any product on this site. We have purchased 8 chandeliers in the past four years. 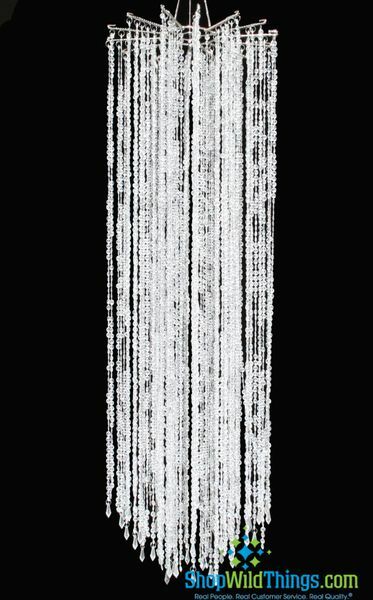 Also we have bought 4 acrylic beaded curtains. We us this at our Elks Lodge for fund raising events , Gala Balls, Weddings. Everyone loves these chandeliers and beaded curtains. 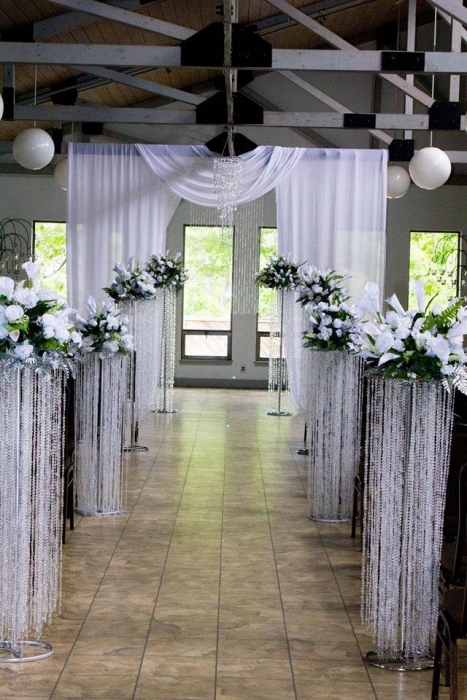 I am an Event Planner and purchased many of these for aisle decor for a Glitz and Glam themed wedding and the results were breathtaking.........I have purchased several different crystal styles from this site and they all are beautiful but these are the fairest of them all. Merchant Response:Your event looks stunning! To reduce tangling, while the chandelier is still hanging, start towards the bottom and loosely tie together a group of strands and repeat this around the chandelier and towards the top, if needed. This makes it easier to store and when you need it again, hang it up and starting at the top, untie the strands. I wasn't prepared for the site of it's length because as I lifted it out of box it seemed to go on and on. The cut on beads made it twinkle and glissen so beautifully with just an overhead light. It can add elegance to a venue for special occassion or dress up an area at home.The hook that it's suspended with is sturdy and can easily be hung and moved . ProsI like the workmanship used on the Falling Stars chandelier. The beads are all octagon shaped and cut so they all reflect ligjt from all angles. I was impressed with the number of beads on each arm and strand it looked full and even from all angles.The metal rings and hook that hold it is very strudy and easy to hang. I liked especially that from a distance it's hard to tell if it's glass or plastic. Absolutely beautiful, these will make any room look exquisite! ProsLight in weight and easy to hang up. ConsSome of the strands fall off, but they are easy to pick back on.